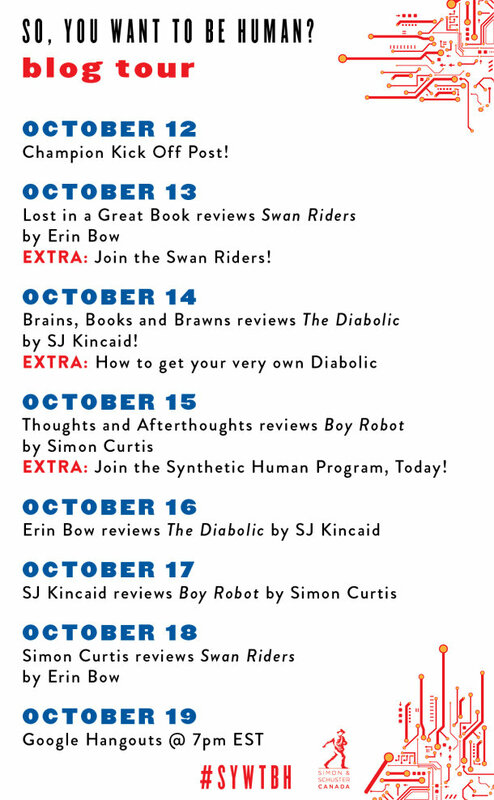 So Simon Curtis, author of BOY ROBOT, Erin Bow of THE SCORPION RULES, and I all have novels that explore the humanity of our protagonists. 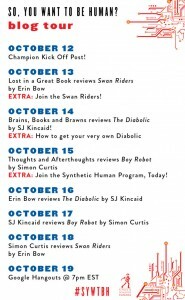 You can see Erin’s review of THE DIABOLIC here and now I’m going to discuss BOY ROBOT. One of the awesome things about being an author is gaining access to ARCs of books before they are published, and this one was definitely a great read! Now, book reviewing is actually a talent, one that I ironically struggle with myself. Instead, I thought I’d post my thoughts about this book in the form of a Q&A! Enjoy! Describe Boy Robot in one tweet! 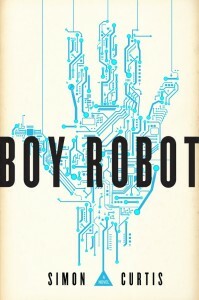 BOY ROBOT = an adventure roaring with adrenaline, brimming with diverse, fascinating characters, and a plot that never stops. How is the world in Curtis’ book different from the one we live in? How is it the same? It’s very much like our own reality with a jagged, unvarnished, and often cruel world but with a key change in that these teenagers are the result of the government seeding synthetic material throughout the population to create these ‘robots’. Now the same covert agency is out to violently contain the results of this experiment. Anyone who’s read about experiments people within our government have conducted such as exposing soldiers to radiation to monitor its effects, or giving unwitting subjects syphilis to see how they fare, knows that this idea isn’t so far-fetched as it seems. The story has stark moments of darkness but they serve to brings out the heroism and the brighter moments for the characters fighting for their freedom. Who was your favourite and least favourite character in the book? My favorite: Definitely Isaak’s love interest, and I don’t want to spoil anything by naming the character. Let’s just say, it was unexpected (for me) but such a wonderful, sweet relationship. I also liked that the love interest wasn’t a robot but rather a normal person doing the right thing, because I think that’s braver, in a way, when you face a situation that doesn’t directly impact you because it’s the right thing to do. Least favorite: Definitely Isaak’s mother! I don’t think there’s much to explain here. She is deplorable. You’ll see what I mean. Were you surprised by any developments in the book? I was really surprised and impressed by the way robots came to be. The explanation was just cool. The government modified kids before they were born to create this population of biosynthetic life forms they then couldn’t control or contain. The idea was just very clever and scarily plausible to me. After reading Boy Robot, what do you feel it means to be human? I think there are any number of definitions of humanity, but ultimately it comes down to the attachments and relationships a person forms in life, those things that form the networks of our existence rooting us into the rest of human race. 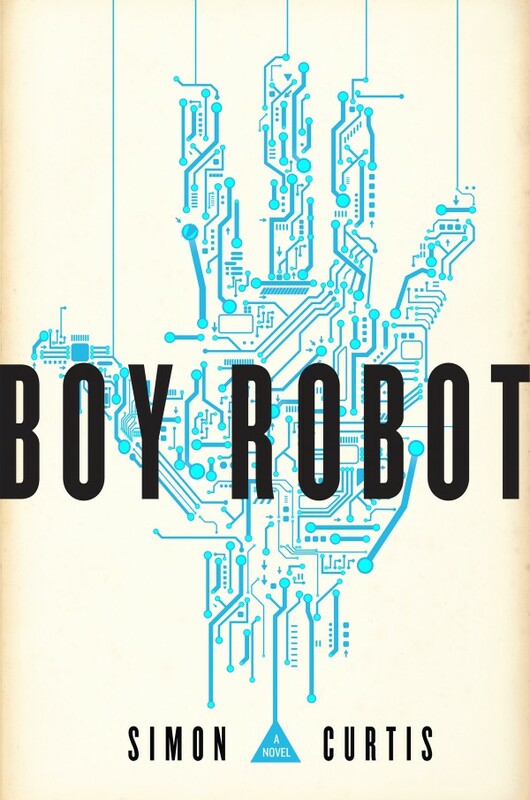 Whether synthetic or not, people love, hate, fear, hope and dream of the future, and I think Boy Robot focuses upon the many shades and depths of these characters who, robot or no, are ultimately as human as they come. I would definitely recommend this book to anyone interested in a fast-paced, adrenaline-filled story with some very excellent romantic tension, a lot of unexpected twists, and just an excitement factor all throughout. I think it would tend toward the older end of the YA spectrum or the more mature readers on the younger end, simply due to the unflinching way the story tackles some gritty, real world issues within the story. Overall, I’d heartily recommend to any reader in search of an exciting, fast-paced story. Is there anything that stands out in this book that is different from your typical sci-fi, YA book? I think the scope of this story is truly admirable, and presented in a way that makes it stand out from a lot of YA books because it’s not confined to one point of view, or even just a few, though Isaak is the center and heart of the story… The narrative challenges the reader. It very interestingly reaches into the minds of a wide array of characters, giving the world a much broader scope than it otherwise would have had. It’s a great and ambitious narrative choice. It’s definitely a book that entertains and surprises more than a few times.